I have no problem drinking water all day long but sometimes I get tired of it. I like to get flavored water every now and then. I like to find some that has no sugar and believe it or not... its harder than you would think. 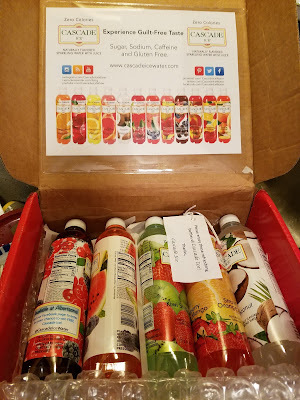 I was recently asked to try Cascade Ice which is sugar free, sodium free, caffeine free, gluten free and has zero calories. How much better can it get? I got to try the flavors of coconut, strawberry orange mango. kiwi strawberry, acai, Pomegranate Blueberry and blueberry watermelon. I have to say that I can not figure out my favorite one. 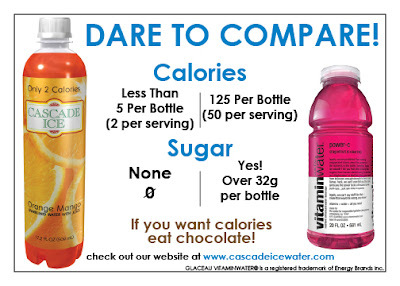 Cascade Ice comes in 22 different flavors and they are all zero calorie drinks because they leave out all the unnecessary extras that should not be in water. Each drink that I tried was packed full of the fruit juice taste and still was fizzy even after being opened for over 12 hours (yes I left it on my desk at work opened all night long). Like most parents, I do not allow my boys to drink pop because of the sugars. Cascade Ice is their new favorite go to drink for after school. This is an item that I have stocked in the house now for the boys. I am not afraid to let them drink this after school like most juice. They actually would rather have this drink because it fizzes like pop so they think they are getting away with something because they get to drink the Cascade Ice. Little do they know, its not bad for them and mom approves. Cascade Ice is available in 49 states and available at most major retailers. 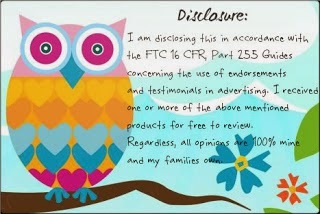 You can also purchase it online at amazon.com. If you are looking to head in the direction of a healthier alternative and ditch the pop and the sugary drinks, look for Cascade Ice in stores today and try all 22 flavors and see if you can decide on a favorite. I will have to get my husband to pick out flavors he would like to try. He likes flavored water. I would drink any of them... I just want to find a flavor he wants to try.